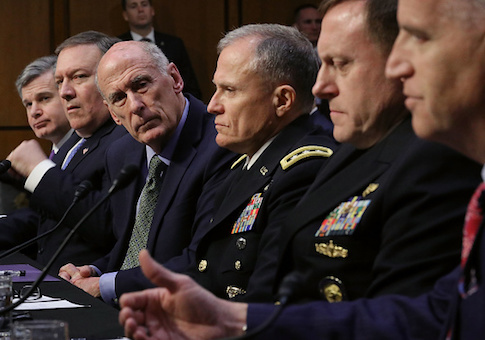 Coats said countering covert Chinese technology acquisition remains a top priority of intelligence agencies and addressing the problem will require greater efforts than in the past. He also supports congressional legislation now pending in both the Senate and House that would strengthen the Treasury Department-led Committee on Foreign Investment in the United States (CFIUS) that reviews foreign acquisitions of American firms with an eye to the national security risks. "The Chinese are pervasive on this," Coats said, "and we've seen it happen throughout both the public and the private sector." In his prepared statement to the committee, Coats singled out China for covert and overt efforts to obtain "proprietary technology and early-stage ideas through cyber enabled means." Other methods include the use of semi-legitimate, legal transfers and relationships "to gain access to research fields, experts, and key enabling industrial processes that could, over time, erode America’s long-term competitive advantages," the statement said. Coats called for closer cooperation between government agencies and the U.S. private sector, and for adopting government-wide, coordinated security efforts. On reforming CFIUS review process, Coats said "I think we need to go beyond what the current process is in terms of evaluating" risks posed by foreign purchases of American firms. CFIUS currently has few staff and investigative resources and often cannot adequately review proposed Chinese and other foreign acquisitions. FBI Director Christopher Wray testified that Chinese intelligence activities and technology acquisition are aspects of what he termed "the China threat." "We've tried very hard to be more out and about in the private sector, in terms of providing what are almost like defensive briefings, so that some of the U.S. telecommunications companies, among other technology industry members, can recognize the threats that are coming their way," Wray said. Wray said the FBI is encouraged by the response of most companies to the Chinese technology acquisition efforts "once we're able to try to educate them." Chinese technology collectors are focusing on smaller startup companies that are not well informed about the Chinese threat, he noted. "The reality is that the Chinese have turned more and more to more creative avenues, using nontraditional collectors, which I think we in the intelligence community recognize, but I think the private sector is not used to spotting," Wray said. Committee Chairman Sen. Richard Burr (R., N.C.) said Chinese telecommunications companies such as Huawei Technologies and ZTE maintain "extraordinary ties" to the Chinese government. Burr said in introductory remarks he wanted U.S. intelligence officials to detail how China's "foreign commercial investment and acquisitions are jeopardizing the nation's most sensitive technologies." Sen. John Cornyn (R., Texas) warned about the threat during Senate floor remarks Tuesday. Cornyn is co-sponsoring legislation that would increase the power of CFIUS to check illicit Chinese technology gathering efforts, something he said is "extraordinarily important." "China has weaponized investment in an attempt to vacuum up our advanced technologies and simultaneously undermine our defense industrial base," said Cornyn, who is the Senate Majority Whip, the second highest-ranking Republican in the chamber. "As it acquires U.S. firms, and technology, and intellectual property, as well as the know-how to put it to use, the risk is that the Chinese government, which has its tentacles not just in state-owned Chinese companies, but also in so-called private Chinese firms, that it will get its hands on these capabilities and use them against us." The comments on Chinese technology acquisition threat come as the Trump administration is preparing to impose sanctions on one of China's largest conglomerates, HNA Group Co., that has invested more than $16 billion in buying U.S. companies. HNA, according to U.S. officials, misled the CFIUS during two reviews of proposed purchases of American companies by not fully disclosing that the company, worth an estimated $100 billion, is partially owned by members Communist Party of China, some of whom are current Chinese government officials. Sen. Marco Rubio (R., Fla.) warned that China poses a long-term threat to U.S. security. "The biggest issue of our time, in my view and, I think, in the view of most of the members of this committee and I would venture to guess, most of the members of this panel, is China and the risk they pose," Rubio said. "I'm not sure in the 240-some-odd-year history of this nation we've ever faced a competitor and potential adversary of this scale, scope, and capacity." Rubio said China is "carrying out a well-orchestrated, well-executed, very patient long-term strategy to replace the United States as the most powerful and influential nation on earth." To that end, China is using all elements of national power—military, commercial, trade, economics, information, and media, he said. "The tools they use are everything from hacking into companies and critical infrastructure and defense contractors to using our immigration system against us, to even our universities," Rubio said. Coats said in response "there's no question that what you have just articulated is what's happening with China." The DNI also said Chinese subversion is being done in a "very smart way" and a "very effective way." "It's clear that they have a long-term strategic objective to become a world power, and they are executing, throughout the whole of government, ways in which they can accomplish that." Under request from Defense Secretary Jim Mattis and other policymakers, U.S. intelligence agencies are conducting a number of studies on Chinese activities, Coats said. The intelligence assessments are "a very, very deep dive into what China's plan is doing now and what their plans are for the future and how it would impact the United States," he said.